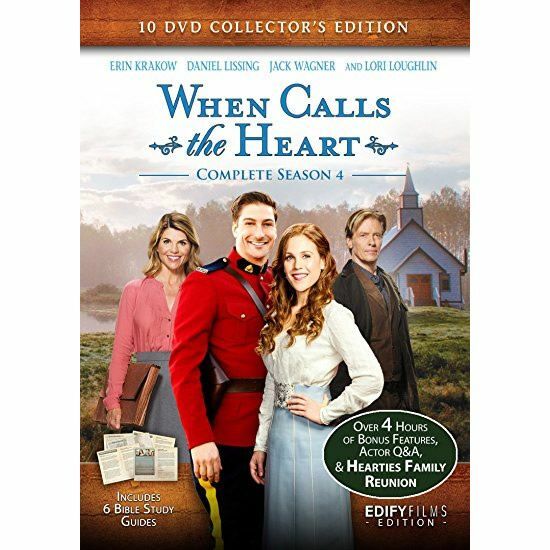 From the Hallmark Channel and acclaimed Director Michael Landon Jr. comes the continuation of When Calls the Heart in the When Calls the Heart Season 4 Collector’s Edition. Inspired by the beloved books by Janette Oke; Season Four continues the story of love, hope, courage, and faith on the Canadian frontier. Follow the young school teacher Elizabeth Thatcher, and the young Mountie Jack Thornton, as they face new adventures, trials, and chapters in this unfolding story set in the small town of Hope Valley. Stars Erin Erin Krakow (Army Wives), Daniel Lissing (Eye Candy), Jack Wagner (Melrose Place) and Lori Loughlin (Full House, 90210). The Collector’s Edition includes 10 DVD’s, featuring 6 Bible Study Guides, the original 12 episode TV shows, as well as 6 movie versions. There are also more than 2 hours of bonus features including Actor’s Q&A, Production Design, the Hearties Family Reunion, and the long awaited video “How the Hearties Began”. Fans will also enjoy scores of interviews with never before seen footage from the cast & creators of the show.